I feel like I’ve done quite a few spotlight posts recently, after having done a four post Wild and Cascading Green Series just last week, but right now, our office is filled with large, lush hydrangeas in all kinds of cool colors, so, I feel the need to talk about them! Hydrangeas are gorgeous flowers that feature a hearty stem with large broad leaves and a large ‘head’ that is made up of clusters of small four-petal flowers. This is what makes them so lush! They also give you a lot of bang for your buck, since, although they can be a bit pricier per stem, you don’t need as many to make your arrangements look full… as an educated guesstimate, I would say one Hydrangea stem could give you the same ‘fullness’ of say 5-8 roses or 3-4 garden roses, this of course depends of the size of the flowers and how tight or loose you arrange them, but hopefully that gives you a general idea. 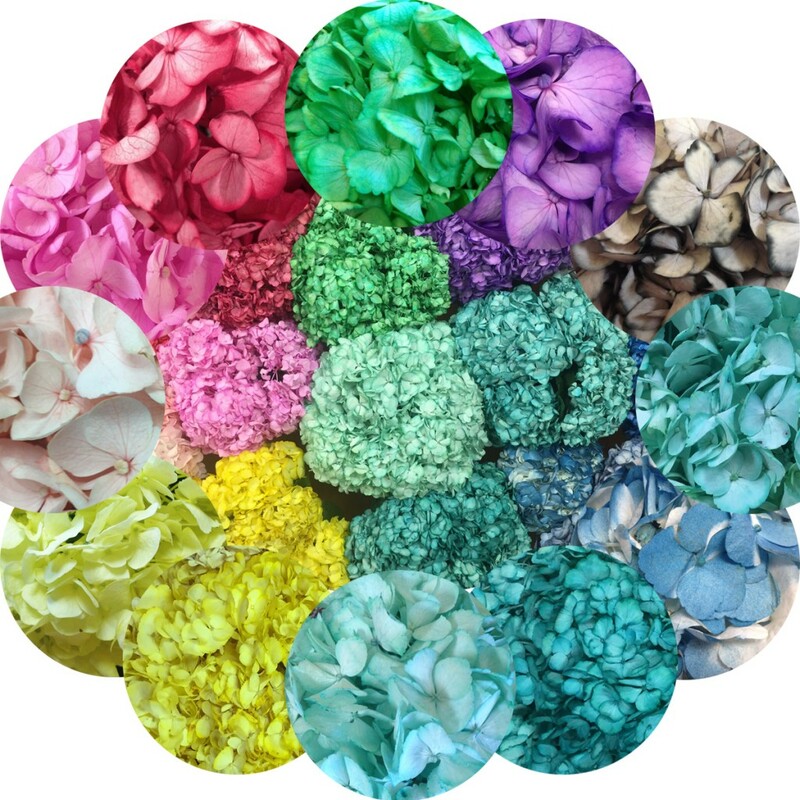 From the impossible to find turquoise and tiffany blue to a regal royal purple and a rich raspberry pink… We even have Hydrangeas with Glitter, which are so cool for the Holidays or if you just want to add a bit of shimmer to your wedding arrangements! Can you see the difference? 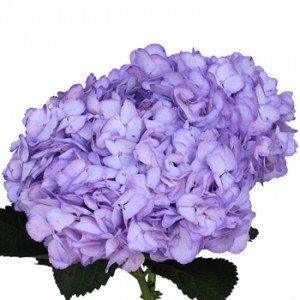 The pink airbrushed hydrangea shows some of the white, while the lavender intravenously tinted hydrangea is all lavender but you should be able to see some areas of darker purple, like around the edges of the petals. There really isn’t one way that’s better than the other when it comes to tinting, it just comes down to personal preference and the colors you want! Fill 2 containers one with at least 4 inches of fresh, cool water and the other with warm water. Using sharp scissors or a knife under running water, cut the stems diagonally approximately an inch from each stem’s bottom edge. Immediately after cutting, place the stems in the prepared warm water for approximately 5 seconds then place the flowers into the cool water. Remove any dark or fading petals. It is normal to find several unattractive, dark or fading petals, all of which can be easily removed without damaging the Hydrangea. Keep flowers away from direct sunlight, drafts or excessive heat. Cooler temperatures will prolong the Hydrangea’s vase life. You may choose to use a floral refrigerator, but it is not required (keep in mind a floral fridge is warmer than most household refrigerators and is free from fruits that can emit harmful gases). Allow your flowers at least 4 hours to properly hydrate before arranging. Change water and re-cut stems every 24 hours to keep flowers fresh. Assure that your flowers have sufficient water. The flowers will drink an exceptionally large amount of water upon arrival. If your hydrangeas are intravenously tinted your water may change colors due to the tint seeping out of the stems…to be safe, keep these flowers separated from any other flowers you may have. Hydrangeas can have a tendency to wilt if they don’t get enough water or are kept in warmer temperatures, but don’t worry, we have some tips to refresh your hydrangea flowers! To refresh the flower, dunk the entire flower head in cool water for approximately 20 minutes. 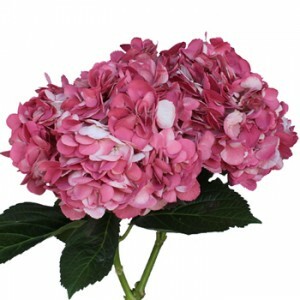 For special instructions, check out: How to Revive Wilted Hydrangeas – Industry Insiders Share their Secrets.